Last month Gigabyte introduced a lot of new Android smartphones, but it looks like there's going to be a new Mika model to complement the GSmart Mika M2 in the company's portfolio. This is the Gigabyte GSmart Mika M3, which has just become official at a special event in Greece, during which the other, already announced devices were present too. The Mika M3 comes with a 5-inch 720p IPS touchscreen, a 13 MP rear camera with LED flash, and an 8 MP front snapper. It's powered by a 1.3 GHz quad-core processor, aided by 1GB of RAM. Internal storage is 8GB, expandable via microSD. Keeping things running is a 1,900 mAh battery. In terms of connectivity, the handset tops out at HSPA+, so don't expect 4G support. There is, however, dual-SIM functionality built in. 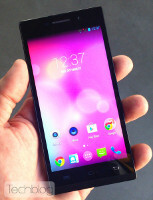 The Mika M3 runs Android 4.4 KitKat, it weighs 146g, and its dimensions are 144 x 70.5 x 8.3 mm. 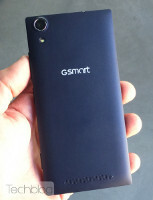 The Gigabyte GSmart Mika M3 should become available (at least in Greece) before the end of the year. Compared to the Mika M2, it has a smaller battery, but higher-res front-facing camera. asus rog gigabyte ultra durable asus directCUII gigabyte windforce asus zenfone padfone gigabyte Gsmart wat again ? :/ Gigawatch coming soon ?